Harmonie Underpads for bed or chair protection are designed to cover mattresses in order to absorb leakages, reduce odors and maintain dryness. They consist of a polyethylene layer combined with sealed edges to ensure leakage protection. The highly absorbent material is evenly distributed throughout the core. 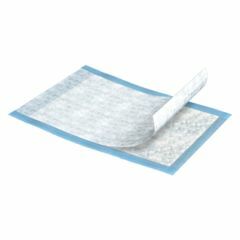 Harmonie Underpads use 100% virgin fluff pulp, which provides far greater levels of absorption and retention than draw-sheets or wadding-filled products. 23" x 36" size provides partial length, full width bed coverage. I buy these by the case and donate them to a local shelter that cares for hospice ferrets. They work great and are very reasonably priced when compared to those sold for pets. Lightweight. Sturdy. Safe. Easy Storage. Protective. Handicapped Senior. large enuf for dog. Pet Owner. Used primarily as puppy pads. We use these as doggy pads. They work gre3at. Pet Owner. Long Term User. Caregiver. Handicapped Senior. Our main use is as Doggie Pads. These are better and cheaper than the pet store pads. Do all the disposable bed pads have sticky backing to keep them in place at night? Or only those that say stay in place. Am using kiddie mattress stick downs on top of bottom sheet...expensive! Not all underpads are sticky. These are not sticky. I have never wanted sticky ones, so I am not sure what wording to specifically look for. These underpads do not have any stickiness of any kind to them. Good for quick use to block liquid and inexpensive. No, they do not have a sticky backing. I have been using the 17x24 that are very good size for a wheelchair seat. Economical and strong. Not so sticky. I use a brace to hold them in place. They do the job for the price.